.... the girls will play. Todd left for a conference for the week, so my Mom (Omie) decided to come keep Avery and I company. We were out and about every day which is a very pleasant change for Avery and me. Yesterday, we also enjoyed a visit from Omie's sister, Carolyn. She treated us to a wonderful lunch at a very nice hotel in Laredo (I know, shocking). Then, we stuck around and swam in the hotel pool. Carolyn joined us for dinner later that evening. This is the only picture I have from the entire week. 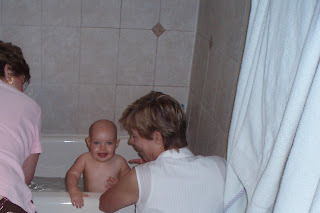 Great Aunt Carolyn and Omie giving Avery her bath. They were all smiles. Omie taught Avery a little something during the week. Thanks Omie for the fun, and mostly for all the help.